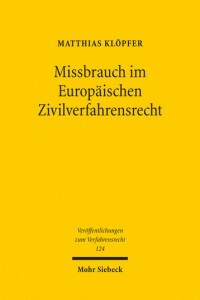 Matthias Klöpfer has authored a book entitled “Missbrauch im Europäischen Zivilverfahrensrecht” (Abuse of Procedure in European Civil Procedural Law). The book has been published in German by the German publishing house Mohr Siebeck. There are times when European civil procedural law seems to actually encourage abuse of law and circumvention strategies. Matthias Klöpfer examines if and how Europe’s so-called prohibition of abuse of law principle can serve as a union-wide approach to regulate abuse of procedure. More information is available on the publisher’s website.